How many business to business companies experience fantastic metrics and trace capabilities of their product shipments only to be let down by the goods receipt link in the chain at their customers location. At home via the retail sector many of us enjoy the SMS text message and email to confirm our birthday present order has been shipped from the sender and then another to confirm its delivery or ease of pick up. These tools have linked business intelligence systems across multi business platforms. For large business we sometimes find they lack the ability for such tracking and yet crave for the information! Managers are often challenged with the complexity of collecting data using reliable hand held devices and then having the time and skill set to analyze the information provided and available. Big data has been identified as a key step in development and revolution within business and yet it’s current true level of penetration within the full supply chain has only just began. It will be clear that the companies who can use the data and simulation with predictive analytics can become the future leaders in their business sectors. Training of managers is important to enable the correct structure, questions and decisions from supply chain data to influence daily and strategic commercial decisions can be made. So far delivery fleet and forklift management software are areas of rapid development and can help lead the progress and adoption into other areas of the business operations. The information gathered over many years has helped companies reduce fleet management costs and identify training needs in specific drivers, plan improved maintenance and monitor productivity. See this interesting article on how assumptions have been challenged by managers not having full data to make operational decisions about their material handling fleet. Big data will expand its reach as the development of the Internet of Things is applied to ever greater extend in business operations. 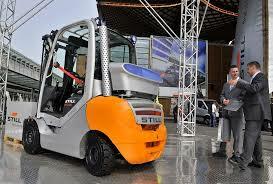 Let us extend the above theme of forklift truck and material handling equipment. Imagine the benefits to management workflow, predictive analysis and and operational efficiency. This could be further extended to the use of mobile devices when achieving product pick rates, replenishment bin management and waste reduction. Key industry sectors that could benefit from these changes will be FMCG such as short shelf life products from fashionable items to food. What areas would you like to benefit the most from big data developments within the supply chain? I would love to hear from you. JAMSO is a global support business. We help your business make changes in performance through goal setting, KPI Management, Business Intelligence and predictive analytics solutions.